Being a parent can be very expensive, especially if your children are like mine and love to eat (and waste) everything that is in the fridge. But there is much more than just buying food for children when you're a parent. You need to keep a roof over their heads by paying rent and bills, buy new clothes, school uniforms, school trips, birthdays, Christmases and so much more. On average a parent can spend over £11000 per child each year, according to Telegraph. Seeing as raising a child or more can be expensive, most parents choose to go out to work. But if you are a couple it can be pretty difficult for both parents to go out to work. The same with single parents, it can be difficult for them to go out to work too. I am in a relationship and one of my reasons for quitting my job when I finished my maternity was because I just could not afford paying the childcare and that is why I decided to quit my job of two years. My partner works 60+ hours a week to bring money into the house. Most of the money goes out on bills and the rent we have to pay. As well as paying for the girls food, clothes and the rest of the things that they need. After I had Elliw, I really did miss going to work. However, after a year I found out more about blogging and I now say that blogging is my part-time job because I have recently made some money through blogging. There are many other things you can do to start a small business from home. I do believe that starting your own business from home can be more difficult than just going into another job because there is so much to do and so much spending to be done when you work for yourself. 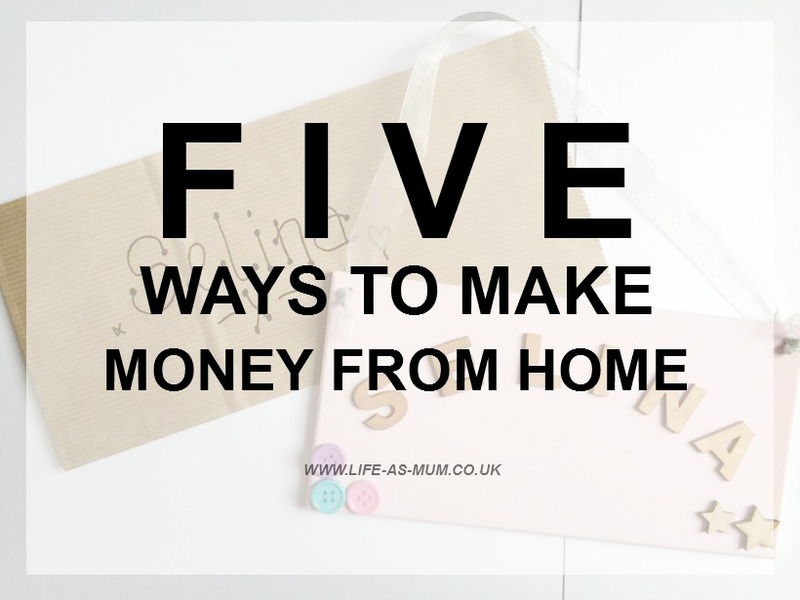 Here are just a few ways you could make money from home. 1. Delivering catalogues - There are many companies out there with many jobs going around every single area of the country. If you like a bit of paper work, delivery and collecting brochures, aswell as earning money, you could look into doing a bit of representative work. 2. Playing online games - There are some online games out there where you can earn a bit of money. You can also check for free bingo which can also bring in a bit of pocket money here and there. 3. Saving Pot - If you know you can save up, why not put your spare change from the shop or in your purse/wallet into a pot and count it after a good few months. 4. Blogging - Making money out of blogging is not easy. You do have to work for it, and I mean work really hard for it. It can take a good few months for some work to come up and earn some money through blogging. If you decide to take this path, be sure that you love blogging as well as earning money from it - otherwise it just won't work. 5. Crafts - There are many craft businesses out there such as handmade blankets, clothes, hampers, sweet stalls, knitting and so much more. If you have a craft hobby, why not share your hobby and make a business out of it! Hi Beth, even though my son is nineteen (he has Aspergers with what I call added extras), I can't leave him to go out to work and part time work is hard to come by. Earning money at home would be a perfect solution for me and I would love to earn some pennies (or cents in my case) through my blog (maybe one day!). A saving pot is perfect for accumulating money without realizing it. Old vitamin tablet tubes are perfect for collecting two Euro coins in, which is how I put back some extra for Christmas.